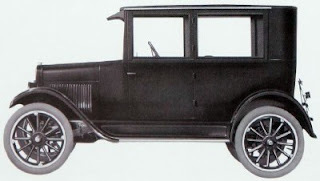 Although Mable Stemple was the first member in Aurora, no branch of the Church was organized until Jim and Myrtle Greer moved to town in May or June 1929. 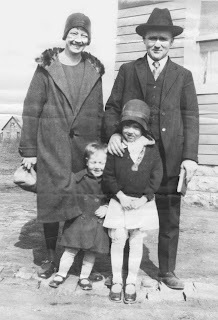 In this early picture of the family in Aurora, Myrtle and Jim Greer appear to be ready for church. Judging by the ages of Jimmy and Louise, this photo was probably taken in the early spring of 1930 (maybe Easter Sunday?). They joined the Church June 20, 1926, in southern Illinois. (Read about their conversion as told by my son John Hamer in a commentary on the blog By Common Consent. After their baptism, the neighbors turned against them, and eventually they decided it would be impossible to raise their children in the Church in southern Illinois. In addition, their small farm was caught in the backwaters of the Great Mississippi Flood of 1927 that actually started in 1926. Their corn crop was wiped out three years in a row. Myrtle said that they read something in a mission publication about Mormons in Aurora, and they thought it meant there was a branch of the church there. Because of this mistake—she later realized it simply referred missionaries being stationed there—they chose Aurora. They also knew some people from “down home” who had moved there and with whom Jim and his friend Jim Boss could stay until they found work.